I grew up with The Addams Family cartoon series back in the 90s and it was so much fun watching the creepy Addams family with a disembodied hand for a pet – who could forget the signature jingle of The Addams Family *den den den den snap snap. They’re creepy and they’re kooky, Mysterious and spooky, They’re all together ooky, The Addams Family. * – ok, the “den”s needed some tone or you won’t get it :-). 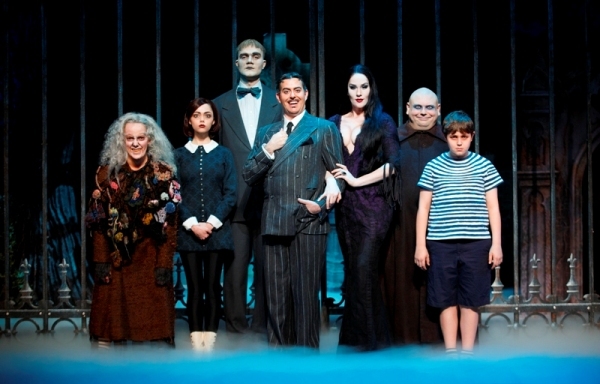 Because of my “familiarity” with The Addams Family, I had initial mixed feelings about “The Addams Family: A New Musical Comedy” when I heard it is coming down to Singapore and performing at the Festive Grand Theatre, Resorts World Sentosa from 9 July to 28 July 2013. Mixed feelings because I would love to see my favorite Addams Family cartoon characters come to live and yet I am slightly skeptical on whether The Addams Family “live” can be as good as The Addams Family “animated”. Everything will change for the whole family on the fateful night they host a dinner for Wednesday’s “normal” boyfriend and his parents. Define “Normal” was the response as Wednesday asked her family to be as normal as possible for that evening and we all know that this evening with The Addams Family will be anything but normal! Among the talented cast of The Addams Family: A New Musical Comedy is seasoned actor Jesse Sharp, who is playing Gomez Addams, the patriarch of the Addams family – you can expect excellent singing and dancing performances from him as he anchored the entire theater performance with a genuine showing of a dilemma between a father’s love for her daughter and husband’s duty to tell his wife everything. He did carry the distinctive Spanish accent of Gomez Addams very well! What was just as impressive was the stage settings – the scenery was lush and stagecraft was clever. Stage transitions were smooth and every bit of the performance at the cemetery to the big gates of The Addams Family mansion to the interior of the mansion was excellently designed and true to the original Addams Family storyline. The greatest voice in this production belonged to Jennifer Fogarty as the dangerous ingénue Wednesday Addams, Gomez and Morticia’s grown-up daughter. Her song “Pulled” held the first act’s musical performances together and you will get to hear her great vocals during her rendition of “Pulled”. 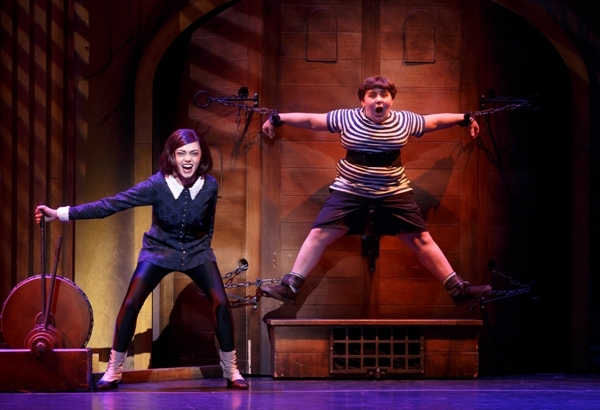 While torturing her brother – Pugsley on a rack (don’t worry, torture is normal in The Addams Family and Pugsley loves it! ), Wednesday admits that love is pulling her in a new direction. I would say The Addams Family: A New Musical Comedy is truly an amazing experience for me as an introduction to live Broadway-style theater. The cast was phenomenal. I laughed a lot, and really enjoyed the enthusiasm the entire cast brought to the show. 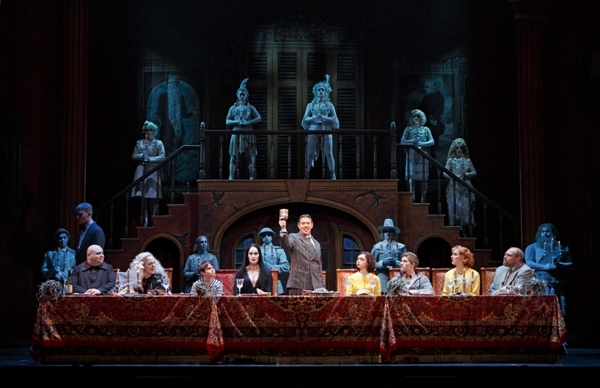 The Addams Family: A New Musical Comedy stayed true to the characters, but still added a few modern references (and Singaporean ones – I will leave it for you to find out for yourself) without taking away the Addams innocence to the world around them. The only thing missing was “The Thing” – the pet hand but it is understandable – It would be hard for a lone hand to share its acting skills on a large stage. 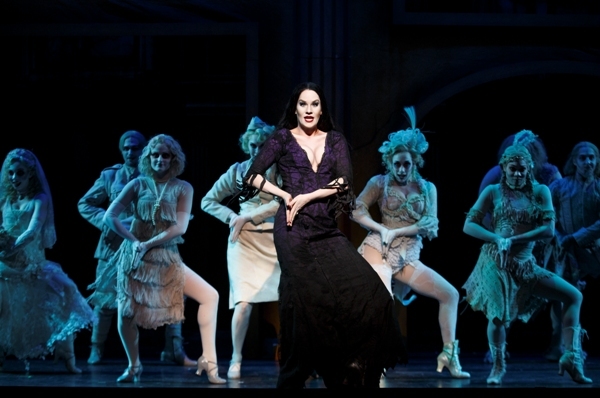 The Duration of The Addams Family Musical Comedy is 2 hours 30 minutes including an interval of 20 minutes. The performance start at 8pm from Tuesday to Sunday and a matinee afternoon performance at 2pm every Saturday and Sunday. 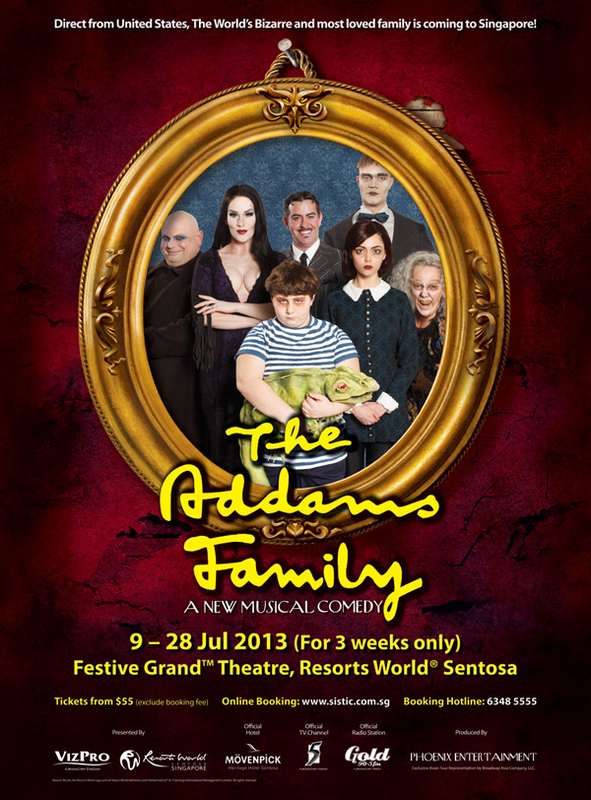 The Addams Family Musical Comedy ends on 28 July 2013. Sentosa Express: Go to the 3rd level (Lobby L) of VivoCity shopping mall to transfer to Sentosa Express to enter the resort. Drop off at Waterfront Station. RWS 8: Proceed to the bus stop either outside VivoCity shopping mall or Merrill Lynch Harbourfront. For a flat fee of S$2.00, guests will be taken into the resort. Take a leisure stroll from VivoCity shopping mall to Resorts World Sentosa via the 700m long Sentosa Boardwalk. Featuring canopy-covered travellators, F&B and retail, enjoy the panoramic view of the bay as you walk to Sentosa. A S$1 entry fee to Sentosa applies. Take any of these buses (65, 80, 93, 188, 855, 10, 30, 97, 100, 131, 143, 145 & 166), alight in front of VivoCity and hop on to RWS 8. Take the Sentosa Express located on Level 3 VivoCity (Lobby L) then alight at Waterfront Station. A flat fee of S$4.00 applies.